I used a CDD in a lace shawl and I liked the look of it. It does not ravel easily which can be good or bad. Anyway, here it is: slip one, knit one, pass slipped stitch over knit stitch, move stitch back to left needle, pass second stitch on left needle over the knit stitch, move back to right needle. 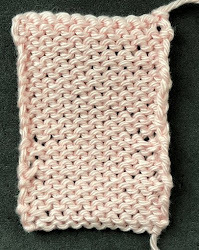 Another method that does not move the stitches back and forth so much is to slip first stitch, pass second stitch on left needle over first stitch, knit stitch, pass slipped stitch over. Both of these put the decrease in the row below. The first puts the left stitch over the right stitch, the latter reverses this with right stitch over the left. Is this a standard DDC? Is there a reason not to use it. You have to be careful with tension because this is almost like a knot and there is not much flexibility.